The McCarthy is like a skyscraper floating on its side. It is longer than the IDS Tower in Minneapolis is tall. 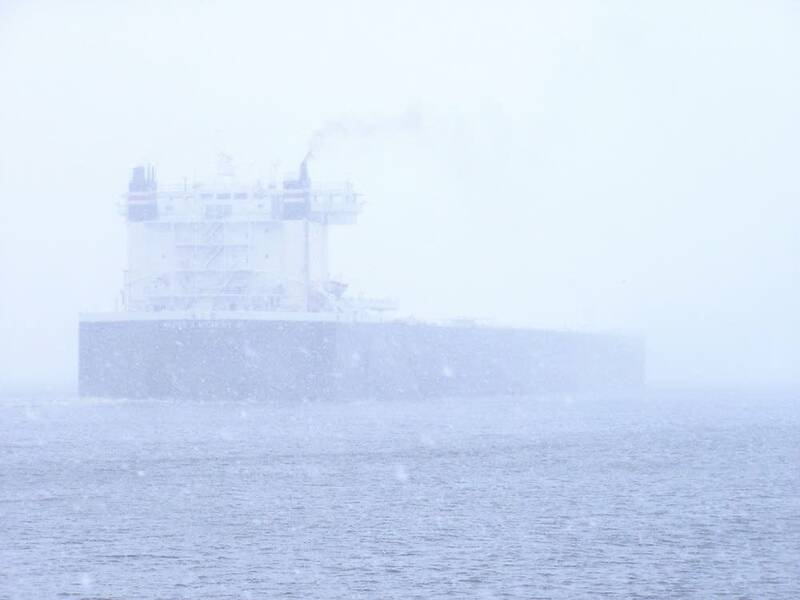 The ship was coming into dock in Superior for the last time this winter Monday when something went wrong. Crew members report the ship striking something -- they do not know what -- and the water came gushing into the hull. Lieutenant Aaron Gross is the Coast Guard's Chief of Port Operations. "The motor vessel Walter J. McCarthy struck an unknown submerged object, piercing the hull and subsequently flooding the vessel's engine room. The vessel's crew attempted to stop the flooding while at the moorings, but the efforts were unsuccessful." The crew shut down the engines, sealed the flooding engine room and everybody got off the ship. Gross says the Walter J. McCarthy then essentially sank in the shallow water next to the Hallett Company dock. "The ship is not underwater but is resting on the bottom along side the pier, a few feet less than it normally drafts." Clearly, the next step is to get the water out of the ship, but that comes with a hitch. If there is any petroleum products like grease or oil in the water, you cannot just pump it back into the harbor. "Well, it depends on what's in the water. And that's where the role of the states will come into play, in Minnesota and Wisconsin, as to identifying what actually is in the water and whether that'll be safe," says Gross. But there is also some urgency. The McCarthy is without power and without heat. It is a giant metal box sitting exposed in icy water with temperatures in the single digits above and dropping below zero Wednesday night. "That is definitely a big concern for a salvage operation like this. And there are ways to kind of mitigate some of that. Definitely that is a huge concern, and time is of the essence." The problem is, you cannot fix the ship if it is full of ice. The Walter J. McCarthy was putting to dock for the winter. Lake Superior shipping came to an official end today with the closing of the locks at Saulte Ste. Marie Michigan. The ship was supposed to spend the rest of the winter in Superior and then go back into service in the spring. The McCarthy has primarily been hauling coal. The McCarthy is owned an operated by a Chicago-based company, GATX Corporation. GATX's Rhonda Johnson says they are coming up with a plan to drain the ship and do so without hurting the environment. "You know right now it appears that there is no oily residue on the water, so that's good news, but we want to make sure that we keep it that way." Johnson does not know what damage might be done if the water that is in the ship's engine room should freeze. "It is already under water. I suppose if it freezes and then thaws out there's not much worse damage I suppose that it could do than just having it underwater. But it would extend the time that you would need to make the repairs because you'd have to thaw it out first and then remove the water." It is impossible to say how much repair work will be needed to fix the gash in the hull, and to get the engines back in working condition. The costs will not be known until GATX can assess the damage. It is possible repairs can be made where the vessel sits or it might have to be towed to a nearby Superior, Wis. shipyard with a dry-dock. Johnson would not speculate whether the ship will be ready to sail again by mid-March. The McCarthy carries a crew of 24. Johnson says it is difficult to say what a ship like the McCarthy is worth. They have not built any ships like it since the 1980s. But she says it would take $50 million to $100 million to build one like it today.